For customers who fail to show for their booking – we will take payment for your full booked stay. Non-guest visitors are NOT allowed on Haka Lodge premises between 8 PM and 8 AM. Non-guests found on the premises between these times will be served with a Trespassing Notice and reported to the authorities where appropriate. Check-in time is 14:00. If you arrive early, we offer free luggage storage until your room is ready. Check-out time is 10:00. If you fail to check out on time, you will be charged a $50 (or 50% of a night's stay, whichever is greater) late check out fee to the credit card you checked in with. Any voucher given when booking pre-paid accommodation (from i-Site etc.) must be presented at check in. Full payment will be required if you do not have a voucher. For customers who fail to show for their booking – we will take payment for your full booking. Alcohol may only be consumed in communal living areas, such the lounge, kitchen or outdoor deck area and we ask that most drinking be done by 10:30 PM. Smoking is not permitted indoors at Haka Lodge. Any customer found smoking indoors will be evicted and no refund will be given. Designated smoking areas may be available – please ask staff. We also do not allow ‘smoke-less cigarettes’ or e-cigarettes to be used indoors - please use these outdoors in our smoking area. 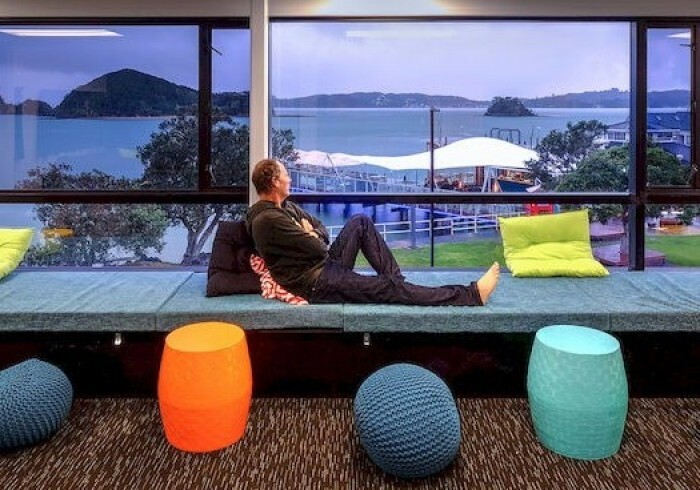 With stunning views over the marina and islands, Haka Lodge Paihia has the best spot in town! From here you can easily tick off bucket-list activities such as swimming with wild dolphins and sailing around the Bay of Islands. We are only a short stroll from the bars and local hangouts which means you can party with the best of them whilst knowing that a quiet night’s sleep awaits you back at the Lodge. Our staff are multinational, friendly and ready to you help you experience the very best of Paihia! We are a premium penthouse backpackers located in central Paihia with amazing views and an ethos that puts the customer before anything else. We have brand new kitchens, bathrooms, living areas and bedrooms (in fact, the whole place is brand new!) and everything is top of the line in quality. Our bunk beds already have a reputation at our 4 other lodges for being comfortable and unique – they are wooden beds that each have their own power outlet, reading light, privacy curtain and lockable storage area under the bunk. Our private rooms feature flat-screen TVs, a seating area and quirky designs that we’re sure you’re going to love. Everything about the hostel is geared towards our customers having the best stay – flat screen TVs, free unlimited WiFi, free tea and coffee and much more. We also offer female-only dorms when requested and go the extra mile to make this a comfortable location for all of our customers. Free unlimited Wi-Fi – While you’re browsing, why not like Haka Lodge on Facebook?